How Do Bald Eagles Mate and Reproduce? 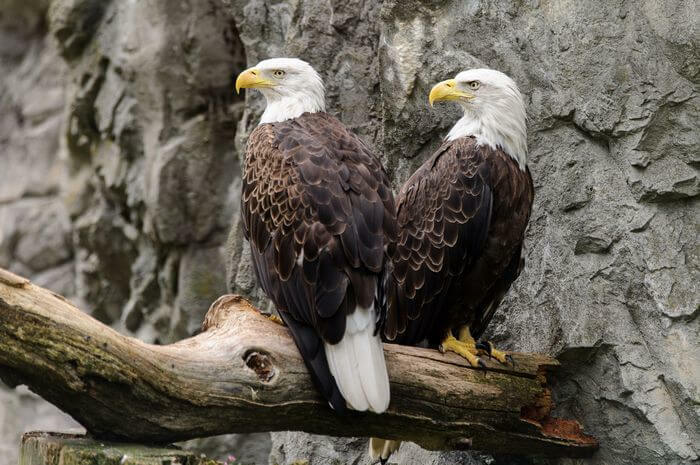 A male and female bald eagle will lock talons with each other and dive through the air to reproduce. Bald eagles mate for life until death and begin to breed at the age of 5 years old. A female bald eagle will lay two to three eggs, and both the male and female parents will work to protect the nest from possible predators and older sibling eagles. A bald eagle’s nest can span up to 9 feet across and weigh up to 2 tons. Although bald eagles migrate, bald eagle families will return to the same nest each year and continue adding to it.